Beaching Wedding is beloved by many couples. It is an outdoor wedding which is less formal. Both you and your guests can walk on the beach with their bare foot. The dressing code can also be less formal. 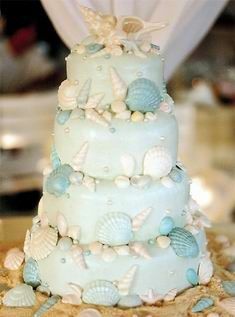 When you consider the wedding cake for your beach wedding theme, it can also be less formal, or to some extend full of fun. You may consider the following issues when you design the cake for your beach wedding. In fact there are some common considerations for the wedding cake no matter it is a cake for a beach wedding or not. One of these considerations is the size of the cake. In fact, the way to decide the size of the cake is still the number of guests. This should be a universal formula of wedding cakes for all wedding themes. 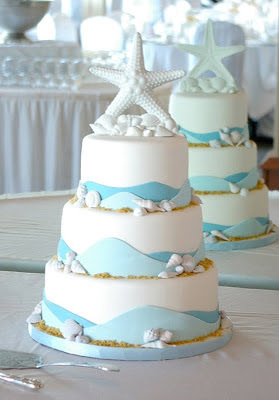 There is no definite style or shape for a wedding cake for a beach wedding theme. However, you may probably start to think about the beach or the sea. How you can capture the notion of the beach or the sea into your wedding cake is probably one of the ways to design the cake. Treating the cake like a sculpture instead of merely a cake can certainly help you to get more ideas. When it comes to the cake toppers, it can be something interesting and at the same time related to the beach theme. For example, you can try to find toppers which are in the shapes of starfishes or even in the shapes of turtles. Since they are not standard wedding cake toppers, you may need to search for these toppers from bakers who work more on cakes for kids. Other decorations of the cake can also be followed the notion of beach and sea. For example, you may think of a palm tree when you design your wedding cake decorations. As in the case of the style, there is no definite flavor for a wedding cake of beach wedding. However, you should consider the high temperature and the sun. A cake which is made of ice-cream will probably not be your choice since it will melt quickly under the sun. Since a beach wedding is a bit different from other wedding, there are also some cautions for your wedding cake. It may probably be quite windy on the beach and the sand may be blown on the cake. In this case you will need to think of some way to protect the cake. It will be wonderful if the protection is also part of the decorations. Even professional designers will go for this idea. Besides, as discussed above, due to the high temperature on the beach, it will be also a good idea to keep the cake in a cooler place before you cut the cake. To serve the guests, you can also consider ordering mini cakes and pack them in separated boxes so that they can be protected from both the sun and the sand. Hygiene is always the number one consideration when it comes to food.